Aaron Coomes of Waggener High School and Caitlin Roy of Brown were named the Courier-Journal Boys and Girls Special Olympics Athletes of the Year. 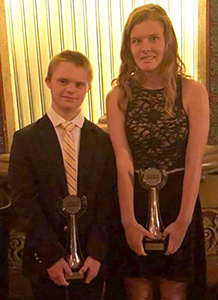 Louisville athletes Aaron Coomes and Caitlin Roy were honored as the Louisville Metro Special Olympics Athletes of the Year at the annual Courier-Journal Sports Awards. The recognition came alongside dozens of Kentuckiana High School athletes honored on June 7 at the Palace Theater. Coomes, of Waggener High School, has been a Special Olympics athlete for seven years. He excels in the Special Olympics swimming program, and also participates in basketball, softball and skiing. Roy is finishing her school work in the Ahrens Transitional Program at Brown High School. She has been involved with Special Olympics for 12 years, competing in basketball, softball, bowling, flag football and track and field. In addition to her traditional Special Olympics competitions, she has been active in Brown’s Unified sports programs, representing the school in both Unified Basketball in the Jefferson County Public Schools league for five seasons and in the KHSAA’s Unified Track program. This track season, she ran non-Unified events with the Brown High School track team. The change this season is to help Caitlin prepare for this summer when she will represent the state as part of Team Kentucky at the 2018 Special Olympics USA Games in Seattle, Washington, where she will run the 100-meter dash, 200-meter dash, 400-meter run and the 4×100-meter relay. Each award presentation was preceded by a short video produced by the Courier-Journal about each athlete. This was the third year that the Courier-Journal has included Special Olympics athletes as part of the awards. Other Special Olympics Kentucky honorees include Jamil Danzy of Ballard High School and Hannah Ballard of Southern High School in 2016 and Dallas Derringer and Catelynn Alpiger last year.